"Aa-rathi" is a Sanskrit word meaning "The Close". "Aa-rathi" is the prayer song sung at the close of each Bhajan session. 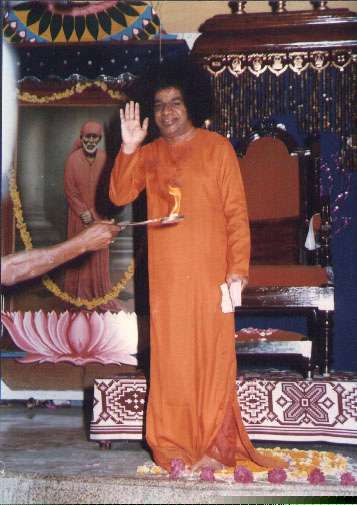 The "Aa-rathi" at the close of Sai Bhajans is really of profound significance. The camphor flame has itself has been endowed by Bhagavan with the value and validity of a grand prayer, the culmination of the hour-long yearning of all devoted hearts. Bhagavan says, "While it is being waved pray - O Lord! Make the allotted span of my life as pure, as fragrant and as transparent as camphor; let it consume itself in the fire, scattering light and the warmth of love to all around me and at the end of it all, let there be nothing left of me (as the camphor leaves no ashes or residue) to render me liable to another sojourn amidst pleasure and pain.". This is the prayer with which every session of homage to to Sai can appropriately close. O Splendorous One ! O Lord of Lords - Lord Sai ! Thou Form is Pranava. We pray Thee to accept the auspicious waving of flame of light (signifying the removal of ignorance). Victory to Thee, O Lord of Universe, Resident of Mandhar mountain - Lord Giridhari. OM SHANTIH ! SHANTIH ! SHANTIH ! Lead Me : From untruth to truth; From darkness to light; From death to immortality. From the transcient world of decay lead me to the everlasting world of Bliss. Let the effulgence of Thy grace illumine my being with Truth. Save me from this cycle of birth and death and destroy the cravings of the mind which produce the seeds of birth.